Lag Bolts vs Lag Screws - What is a Lag Bolt? Lag bolts are actually lag screws by definition but they are more commonly referred to as lag bolts. The most popular lag bolt has a hex or hexagonal (six sided head) and is used to secure wood to other wooden, concrete or masonry material. They can be used without a pre-drilled hole or with a smaller sized pre-drilled hole to prevent wood from splitting. Lag bolts should be used with an appropriate lag expansion anchor for masonry and concrete applications. 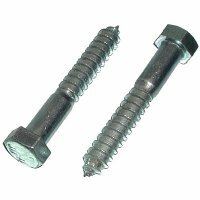 Lag screw/bolt pictures are a general representation and not an actual picture of the product you will receive. Threads will vary according to the individual bolt sizes and dimensions. ISO standards for threads are: length is twice the diameter of the bolt plus ½ inch. If you are looking for fully threaded bolts please call direct at 800-872-5557.